Just because the sun sets, doesn't mean you're done with the job. In fact, as some road crews can attest, they work predominantly at night. Powered by a tow-behind generator, light towers provide lighting and much-needed safety to crews working through the dark. 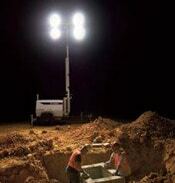 With as many as four high-power light bulbs, you can illuminate up to 24,000 square feet per tower. You also have the option to go solar. Solar-power won't include loud engines and a supply of fuel to run, just sunlight. Solar panel photocells are expensive, so the upfront cost is higher. However, your operating costs are nearly non-existent. If your only need for a tow-behind generator is a light-tower, you can opt for a unit that powers just the light. This option is generally much cheaper, but you're obviously sacrificing power and versatility. Tow-Behind Generator Buying Guide - How to Pick the Perfect Towable Generator. Advice from product experts at Electric Generators Direct.